We just wrapped up the “dungeon” layer of the moat house. In going through the dungeon I had felt that the combat was cramped, and just too “close quarters”. It wasn’t until after the last fight, and reading the last room description that I figured out why. The last room they searched was an offshoot of a larger room, which was used to store supplies. The room was 2 x 4 squares on the map. 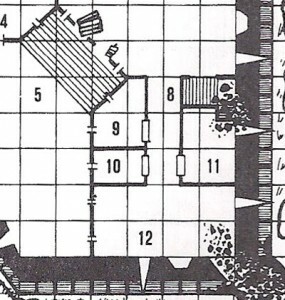 Coming from a 2e AD&D background (and subsequently 3e and 4e), I mapped this room out with 5′ squares as 10′ x 20′. Much to my surprise the room description listed it as a 20′ x 40′ room. I reviewed the map again, and skimmed through the entire description in the module. At no place did it ever give a scale. The overland maps each have a scale. The map of Hommlet is 30′ squares, and the map of Nulb is 20′ squares, and the map of the Temple exterior goes back to 30′ squares. I found a scale note in the page corner of the map that detailed the Church of St. Cuthbert in Hommlet, and it says “Scale: 1 square equals 10 feet”. So this week the party finished the ground floor of the old moat house. The finished out in the southeast corner and I stumbled across a unique situation – at least in my experience as a player or as a DM. The party’s gnome thief/illusionist decided to reconnoiter down the southern hallway and see what he could find. He felt that he was successfully being quiet and sticking so the shadows, so he proceeded with caution. He made his way into the last room and proceeded to scout the last room. He was using is infravision to scout for enemies in the darkness – and found none. What occurred next was a unique situation, fueled by my fleeting memories of 9th grade Biology. The gnome was searching without torch or lantern, and using his infravision to search out enemies. Unfortunately he didn’t see the giant snake – a cold-blooded creature – hidden in the rubble of the southeast corner, in the rubble of room 12. Fortunately (for the snake) it senses prey purely by heat, and readily “saw” the morsel sneaking into it’s layer. The gnome was duly surprised by the snake, but was able to call in reinforcements. What transpired was a rather quick and uneventful fight. However, it was a good learning experience for the gnome that even a successful Move Silently and Hide in Shadows aren’t assurances of being undetected. The party left from Hommlet and proceeded toward the town of Nulb and the Temple of Elemental Evil. Along the way they came across the ruins of the old moat house, which had been the forward post for Nulb and the Temple. Their approach and entry into the moat house saw them defeat a set of giant frogs (luckily the halfling didn’t get swallowed), and a poisonous giant spider (luckily the tank saved versus poison AND remembered to lead the spider into the open so the whole party could engage). Between these two encounters the party ended up low on hit points and low on magic. They ended up resting to heal in the main entry room (#5). They were summarily ambushed by the brigands which had been holed up in the northeast corner of the boat house. Though the fight was arduous, they triumphed due to good tactics and quick thinking. The party ended up loosing the healing they had gained, and were still without any offensive or healing magic. At the end of the day (literally), they were left with one party member down, two near unconsciousness and their sole healer out of healing magic. With a large pool of hit points to recover, and only one healer, the party ended up spending three complete eight hour cycles of “cast – rest – pray” in healing the party. Full resting only allows for 2hp to be recovered each day per character (3hp if someone has Healing and Herbalism), thus the healing load is carried by the loan (gypsy) priest.